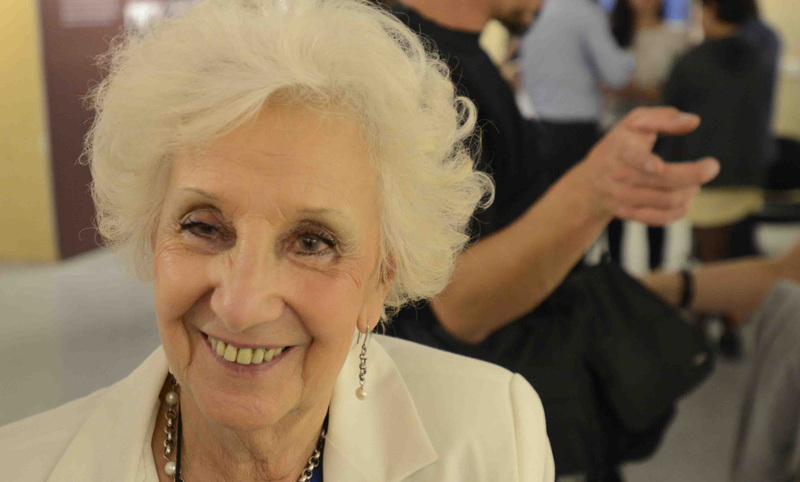 After nearly four decades of searching tirelessly and refusing to give up hope, Estela Barnes de Carlotto finally met her grandson for the first time on August 5, 2014. Estela’s daughter, Laura, had been abducted by Argentina’s military regime in 1977 and killed after giving birth to her son, whose whereabouts remained unknown to his biological family until last year. Estela is president of the human rights group Grandmothers of the Plaza de Mayo (Asociación Civil Abuelas de Plaza de Mayo, or simply the Abuelas), an organization founded in 1977 to find children stolen from their imprisoned parents by the Argentine dictatorship and illegally given away for adoption. During this dark chapter in the country’s history, which lasted from 1976 to 1983 and is known as the “Dirty War,” the government targeted both real and perceived opponents of the regime, including trade unionists, journalists, and students. Many of those abducted and imprisoned simply “disappeared” after being illegally detained, tortured, and murdered. Female captives who were pregnant had their children taken away right after giving birth; an estimated 500 such children were given to families who often had close ties to the military leadership. The judge responsible for the return of many of these disappeared grandchildren gave Estela the news that her grandson had been found. “I could not believe it, we found Guido!” she recalls. Leaning against a sofa at the Abuelas’ headquarters, the 84-year old Estela looks at peace. “I feel ten years younger now. I’m smiling all the time,” she says. Her daughter and Laura’s sister, Claudia Carlotto, coordinator of the National Commission on the Right to Identity (CONADI)—an organization that works closely with the Abuelas to help identify stolen children—agrees. “Since that day, my mother has changed. She visits the doctor regularly, watches her diet, and even takes antioxidants,” laughs Claudia. Photo credits this page: Rolando Andrade and Augusto Alassia. As soon as the news broke, most media outlets and social networks in Argentina echoed the popular sentiment of “we” found Guido. “It was the expression of collective joy that encouraged many to come and find their true identity. The phones wouldn’t stop ringing here. Calls increased from 9 or 10 daily to 300,” Estela happily recalls. However, her smile vanishes as she describes how military families raised the children of the disappeared as their own—a covert practice apparently unique to Argentina. “It’s a ‘privilege’ we had in this country, it was citizen against citizen. A child would be abducted and his identity changed, as was Guido’s. It was a systematic plan that doesn’t have political or psychological explanations,” Estela laments. The only daughter of a middle class couple in La Plata, on the outskirts of Buenos Aires, Estela worked as a teacher and then school principal. She married her first and only boyfriend, Guido, with whom she had two daughters and two sons. That was her “other life,” as she calls it, one that lasted until November 16, 1977, when their eldest daughter, Laura—a 23-year-old college student, member of the Peronist University Youth Movement, and two months pregnant—was kidnapped along with her boyfriend, Walmir Oscar Montoya. Estela and her husband soon learned that she had been held in a secret detention center known as La Cacha. In August 1978, the military handed over Laura’s body; she had been executed after giving birth to her baby, whom she named Guido, after her father. Laura’s boyfriend had also been murdered at La Cacha. Estela was not told the whereabouts of her grandson. A few months later, Estela became a member of the newly formed Abuelas organization. Every Thursday, she joined other grandmothers—all wearing their emblematic white headscarves—in a silent march at the Plaza de Mayo in Buenos Aires demanding that the government inform them of the whereabouts of their missing children and grandchildren. Since then, she has witnessed the trials of over 400 members of the military in connection with crimes committed during the dictatorship, as well as the opening of more than 300 detention centers converted into places of remembrance, including La Cacha. Following Laura’s execution, her son was raised under the name of Ignacio Hurban (he recently changed it to Ignacio Montoya Carlotto, and does not use the name Guido), as the son of Clemente and Juana María Hurban, two retired farm workers from Olavarría, a city in the province of Buenos Aires. The circumstances surrounding his adoption are currently under investigation. Over the last several years, the Abuelas have revised some of their approaches to searching for their loved ones. “At first, we were looking at orphanages, then kindergartens, and then elementary schools. When the children reached an age when they could have more independent thoughts, we started organizing activities in Argentina and elsewhere so that those who have doubts or questions about their origins … could come to our institution for help,” Estela says. They created the Theater for Identity to draw attention to the plight of the disappeared through performances addressing the issue of missing children, and later Music for Identity, in which Ignacio participated as a musician before discovering the details of his own heritage. In June—exactly 36 years after Argentina hosted the World Cup—famous soccer players including Lionel Messi and Ezequiel Lavezzi recorded a television spot with the message, “We have been looking for you during the last ten World Cups. Get closer to the Abuelas!” According to Estela, more people have reached out to the Abuelas for help since that campaign first aired. When asked if she thought she would ever find her own grandchild, Estela replies, “If I found other grandchildren, how was I not going to find mine? During my search, I asked myself, will he be alive? But I remained optimistic. I am optimistic by nature, and today at the age of 84, I live with the conviction that I have so much left to do.” As of June 2015, 116 children of the disappeared have been identified as a result of the Abuelas’ efforts, leaving as many as 400 unaccounted for. Nominated five times for the Nobel Peace Prize, Estela was awarded the United Nations Prize in the Field of Human Rights in 2003. During the last decade, two former dictators have been convicted of the systematic kidnapping of children during the Dirty War: Jorge Rafael Videla died in prison in 2013 while serving a 50-year sentence, and Reynaldo Bignone is currently serving 15 years in prison. Servini of Cubría was removed from this case soon after our interview and replaced by Federal Judge Marcelo Martínez de Giorgi.